The latest figures show that twins account for about 3 in 100 births in the United States. Given the odds, and the fact that Claudette Cook was considered beyond childbearing years, it was the last thing she and her husband expected. 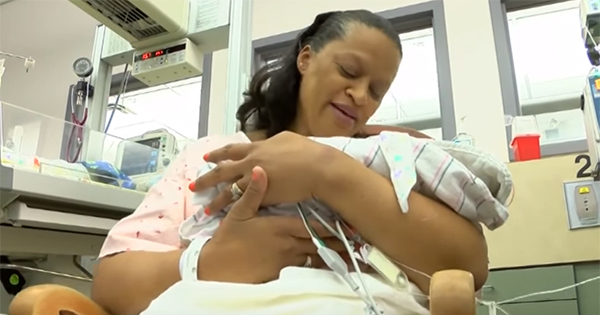 To their surprise, she gave birth to twin boys -- at the age of 60. Claudette Cook and her husband Ross, both from Evansville, Indiana, have been married for 10 years. Neither had any children. But given her age, the doctors told her it would be impossible to conceive. Even though Cook was healthy and in good shape, the possibility of having a child seemed very slim. Then she went to a IVF specialist. In Vitro Fertilization (IVF) is the process of fertilization by manually combining an egg and sperm in a laboratory dish, and then transferring the embryo to the uterus. In the U.S., the live birth rate resulting from IVF for women over 40 is 13-18 percent, according to The American Pregnancy Association. Cook beat the odds and became pregnant with twins. Cook gave birth to healthy twin boys, Isaac and Isaiah, one month before her due date. Both mother and sons are doing fine. According to the Centers For Disease Control and Prevention, 677 women in the U.S. over the age of 50 gave birth in 2013, and the number of women giving birth after age 50 is increasing every year. In addition, a third of the women over the age of 50 who gave birth in 2013 were having their first child. So, Cook is not alone.